“They waited for the elevator. ” Most people love butterflies and hate moth,” he said. “They’re destructive.” “Some are, a lot are, but they live in all kinds of ways. Just like we do.” Silence for one floor. “There’s a moth, more than one in fact, that lives only on tears,” he offered. One of my most favorite movies of Anthony Hopkins and Jodie Foster, but honestly, I understood and loved the movie more after reading the book. Yes, the egg went first before the chicken, so to speak. I always remember this exchange of dialogues every time I see a moth. Last night, I kept pressuring myself to write something, a verse, a mini poem, any. I get this feeling when I overthink, I will feel so alone and numb after, and then I’ll resurrect myself by creating something, may it be poetry, a sketch, a sandwich, a banana floating in chocolate syrup haha, or just anything I can get my hands into. I was feeling this way last night, and didn’t want the added calories before sleeping, so I just opened the window in my bedroom and tried to look at the sky and see if there are stars, luckily there are, and it made me smile. After a while, needed to close the window, and there, I saw a moth trying to get in from the tiny space left before the window is totally closed. I didn’t want to kill it, or hurt its tiny wings, so I blew some air for it to fly away, and it did, back to the darkness of the night where it came from. I am melodramatic as always, so I whispered, “You’re free tiny angel of the light, go and find another moth to make you smile,” I knocked out in bed after that encounter with the moth, and this morning while trying to make myself laugh by making different annoying facial expressions in the mirror haha, I always do that every so often, yes “every” meaning, most of the time when I see a mirror anywhere, my mind by itself kept on visualizing the tiny moth and its wings. It’s actually a light brown colored moth, but I saw some sparkles of pink, silver, and orange in its wings. I might be hallucinating last night because I was soooo tired and sleepy, but still, I believe what I saw. I created this blog WriggledTongue, 2 years ago originally just so I’ll have a space to write anything that I wanted to express on a daily basis, but because of life’s chores and distractions, and my laziness, I’d just posted few blogs and some poetry. I don’t really write thinking it’s for a certain audience or readers, or to get as many likes as possible, nah. I’ve been here taking my share of the social media spectacles, meaning, Twitter, Tumblr, Facebook, Instagram, and this one at WordPress, just for self expression, so my soul can breathe, and sincerely out of curiosity. I always feel better after writing something. Whatever or wherever the status of my emotions is. May it be happy, sad, dreamy, tired, excited, etc. All emotions, welcomed. This is my first post for this year, I stopped posting April, last year. I’ve seen my writings to be sooooo negative and sad, so I decided to retreat from writing for a while, though it became for so long haha. I can’t concentrate, too much action is happening in real life drama, and I didn’t like being always one of the major characters on it. Maybe you have an idea what I mean… Well. This year is a new year, and a beginning to something, may it be wonderful, or hell, it’ll all depend on us, we are each a major character of our own life stories. We make our own paths, so we have to choose wisely. This is what I always remind myself of. I’m not a preachy person who’ll give wisdom and will tell you to do things, or change to be better, no I won’t do that. Yes, I share my tiny bits of learnings through my tweets, but it’s just that, my tweets. On my own, I learned what I learned through making errors, mistakes that helped me to do better choices next time. Until now I’m making mistakes, because I take risks, and that’s okay. I think sometimes we are underestimating our own freewill and intelligence that we succumbed to listening to other people’s opinion and advice, which is oftentimes never good for us. So it’s a balance of intelligence and heart, I said a balance, so nothing is over the other. But cut this crap I’m saying haha, to each his own, find a solution which is best for you and through it all, laugh. That’s the only advice I can give, I’ve proven sooooo many times by laughing, I remained sane. Now back to the moth, I’ve chosen it to represent my reflection for today. 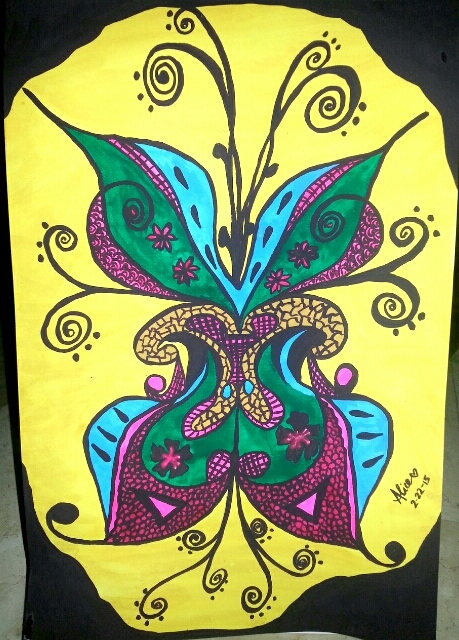 Oftentimes, I say I am a butterfly. I’ve written a poem and posted it here referring to myself as flying back to who I am, a free butterfly. Something like that. If you want to read it, it’s entitled, “Mariposa.” Now that I’m thinking deeper about it, I realized I’m not a butterfly, but a moth. First, a butterfly is diurnal, it is stronger in the day, and flies enjoying the sunbeams and morning breeze. I love the sunbeams, it gives me certain happiness bathing on the beams, but I get to think and make good decisions, and have better understanding of everything I run into, at night. So, I am nocturnal like the moth. Or humbly speaking, a late night muse. The deeper the night, the clearer my mind. Philosophically speaking, night creatures do not tumble in the dark, and neither do humans. We use our dreams, our awareness, and our deeper, inner knowing to navigate through the darkest hours of our lives. Even at the risk of losing its life, the moth is ever-vigilant in following its path of light. The boldness, the fragile vulnerability, the light is its mother, it will follow her course at all cost. This makes the moth open to distraction, vulnerable to harm, it sometimes sheds its precious life, burning itself for being too close to the heat of the light. Such stubbornness, I can relate with the moth, in equal measures. So many lessons to learn from it… And to that tiny brown moth I met last night, thank you. You reminded me a lot about myself. I would love to fly high with you, but this time, to always have a clearer runway for happy, and safe landings. A moth can blend in to the point of invisibility. How clever. This is a metaphor for us to use our environment to our advantage, blend in when necessary, adjust and adapt when the situation requires it. Never underestimate a moth, faith is another tool it uses to move through shadowy times of uncertainty. It never questions provision. It has complete faith that all of her needs will be met each night. You’re free tiny angel of the light, go and find another moth to make you smile. This entry was posted in A Hitch In My Footsteps and tagged Alice In Wonderland, Darkness, Emotions.